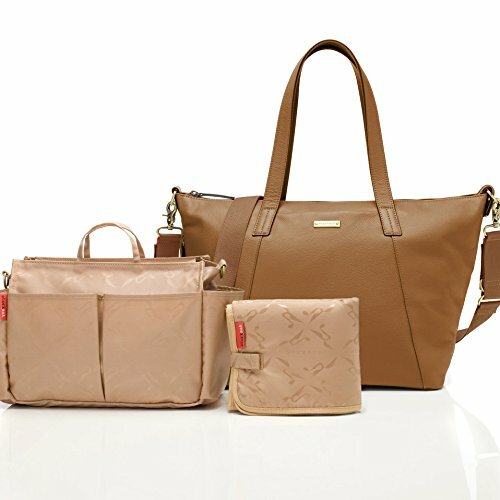 If you’re heading out the door with your baby, you most certainly won’t want to forget the diaper bag. If your baby needs a fresh diaper, change of clothes, bottle, pacifier, or toy while you’re out, your diaper bag will come in handy. Speaking from experience, I suggest that you always keep it stocked and somewhere it won’t be forgotten. So, as you can see, your diaper bag will become an absolutely indispensable item once you have a baby. (Though it’s not a bad idea to keep some extra diapers and wipes in your trunk, too. Just. In. Case.) And no, your diaper bag doesn’t have to look like a diaper bag. It’s possible to be carrying a diaper bag AND maintain your super sophisticated and stylish self. What Should You Look For in a Diaper Bag? Lots of Space: I know babies are tiny little creatures and you’d think to yourself “How many things can this little guy possibly need?” The answer is: more than you might expect! 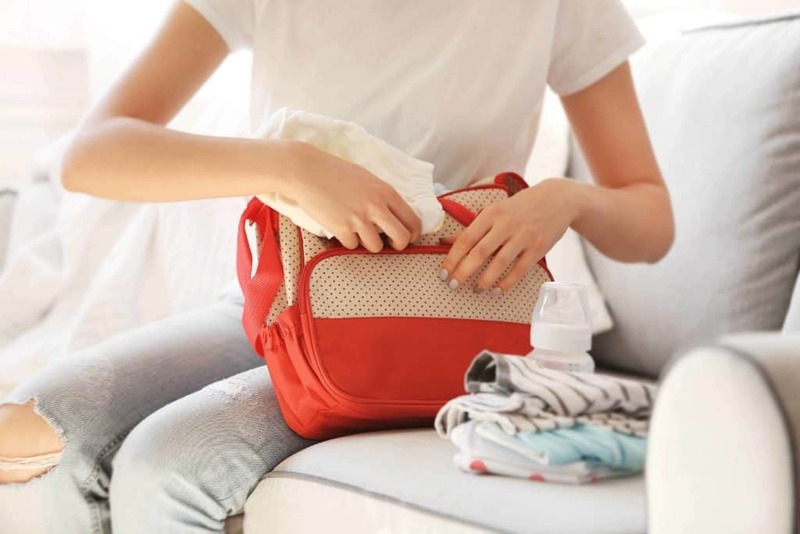 Your diaper bag should be big enough to fit at least one change of clothes, 4-5 diapers, baby wipes, a blanket, pacis, a couple of toys, and a bottle. You will also need some extra space to keep your things like wallet and keys (unless you plan to bring your own purse). Handy Compartments: This is probably one of the most important features to look for in a diaper bag. Because there are so many things you need to put in the bag, compartments will help you stay organized. You won’t need to keep fumbling around in the bag looking for your baby’s socks; they’ll be neatly tucked away in a side pocket. I love having a “go-to” spot for everything in my diaper bag. It helps me to know where I keep the pacifier, the car keys, or an extra burp cloth. Consider the Materials Used: How important is it to you that the bag be organic or only made from natural materials? 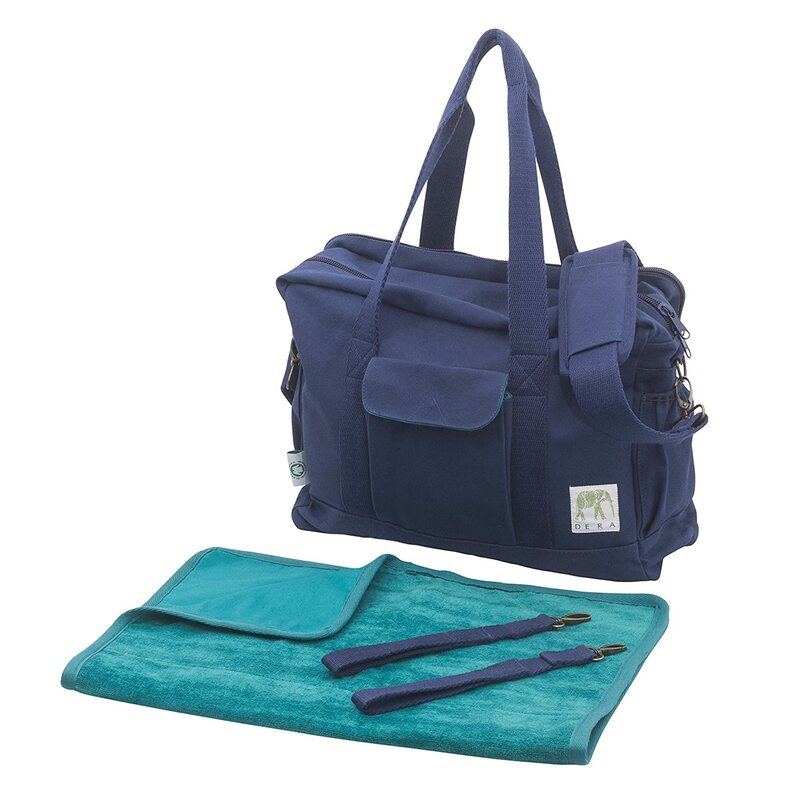 Though I believe it’s important to avoid harmful materials like PVC or teflon (which is sadly used in this gorgeous bag), I don’t think that your diaper bag needs to be organic. It doesn’t usually make direct contact with your baby, so I personally don’t stress too much about the materials used. I do like a bag that can either be washed or wiped down easily, though. And, I’ve included all the non-toxic diaper bags I could find on this list as well. There’s no one perfect diaper bag, and you really have to find the one that works for you. Scroll through the list and find the stylish diaper bag that best suits you and your personal style! If you’re looking for a good quality, durable, non-toxic diaper bag, this one will be perfect for you! 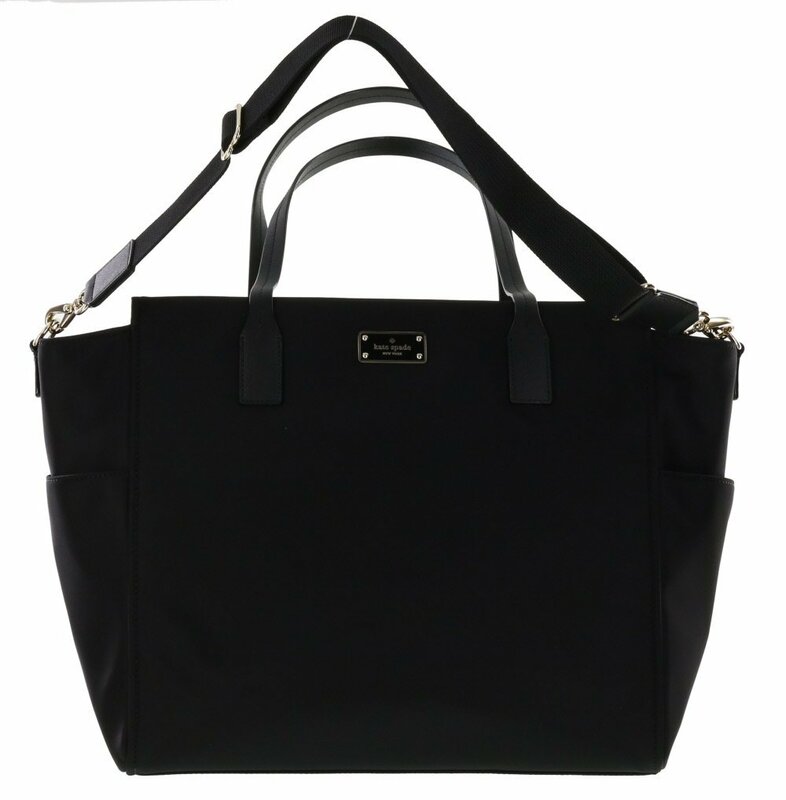 It’s versatile enough to work as a spacious, chic hand bag or a multi-purpose diaper bag. This bag is a perfect combination of style and convenience – with more than 9 pockets, carefully placed so you can find your essentials exactly when you need them! 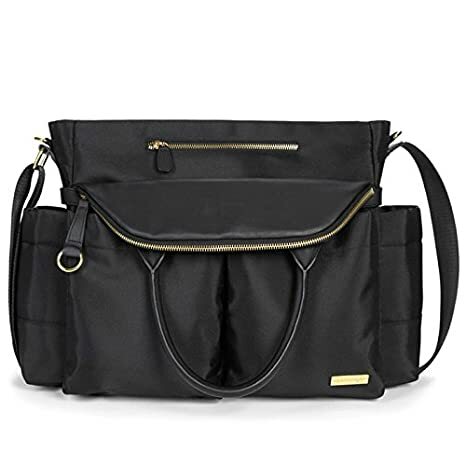 Made from 100% polyurethane vegan leather, the bag is PVC-free so a great choice if you’re searching for a non-toxic diaper bag. 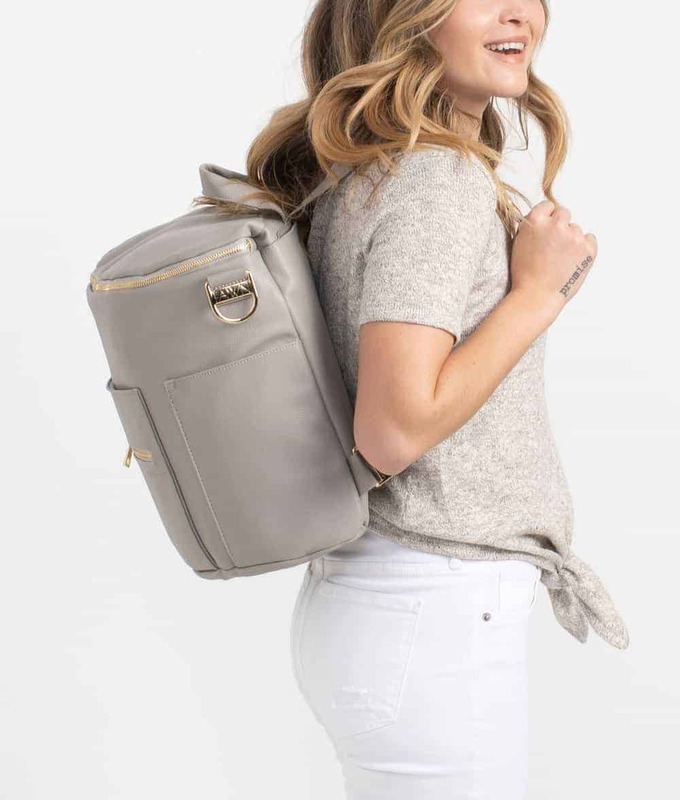 If you’re looking for a bag that you can continue to use long after your children are out of diapers, this is one of the stylish diaper bags that would make for an excellent choice! The bag perfectly combines style with durability and versatility. Made from recycled PET bottles, this bag combines sustainability with class; it’s one of those super stylish diaper bags with all the features you’re looking for. 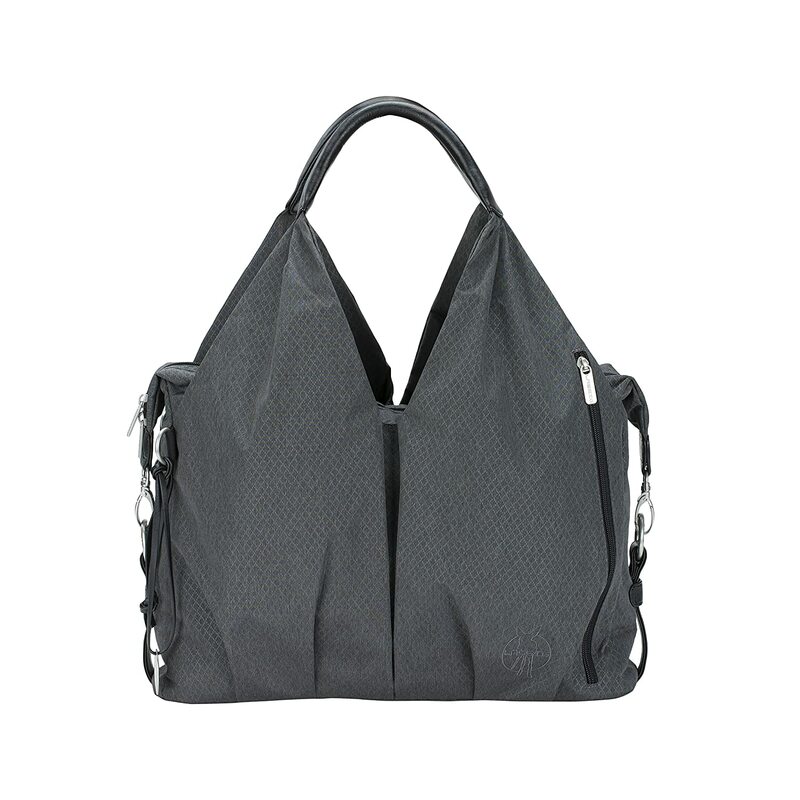 This bag is chic and has great functionality. It’s ideal for everyday use and has plenty of space to fit everything you will need for your baby. 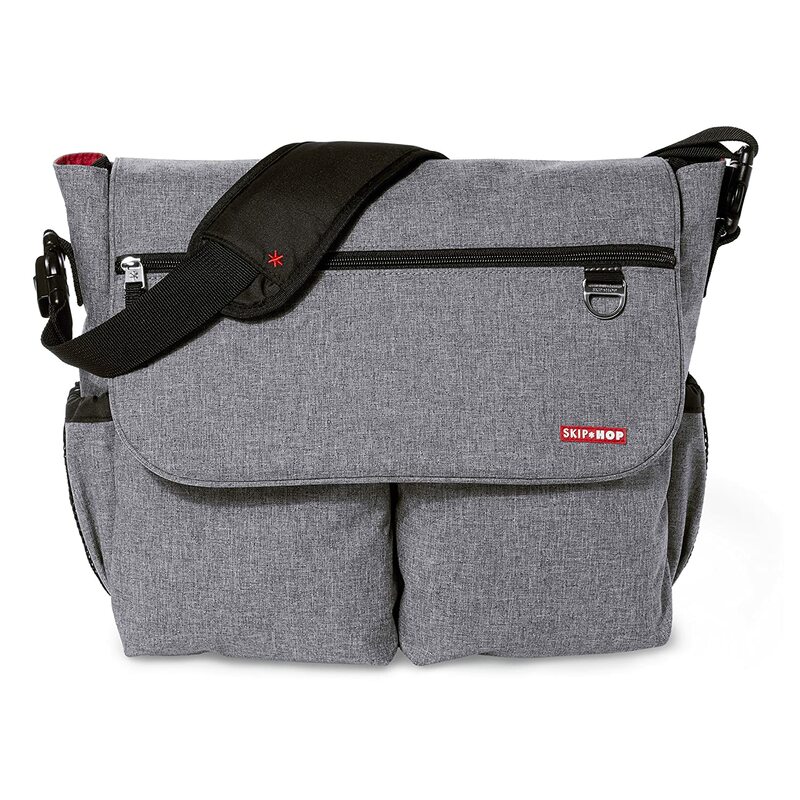 It definitely earned a place on the list of best diaper bags for your baby! Plus, I can imagine that men would feel pretty comfortable using this diaper bag as well, so it kind of does double duty. This is one bag that both moms and dads are sure to love! 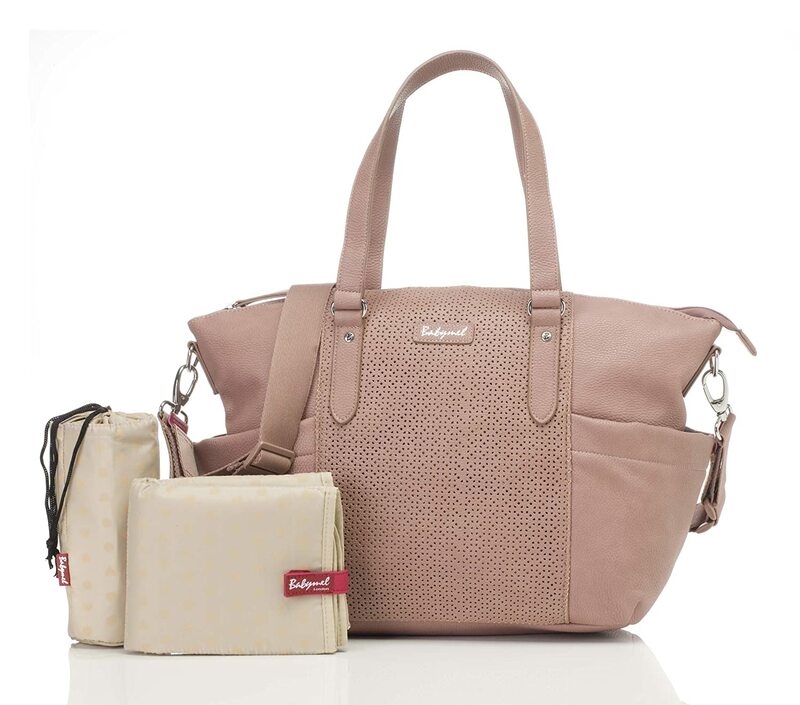 Perfect for families on the go, the bag is super comfy to carry around with lots of easy access pockets. It is made with all-natural materials and is a hit with some of the moms in my Facebook group. This is probably the most gorgeous diaper bag that exists anywhere. 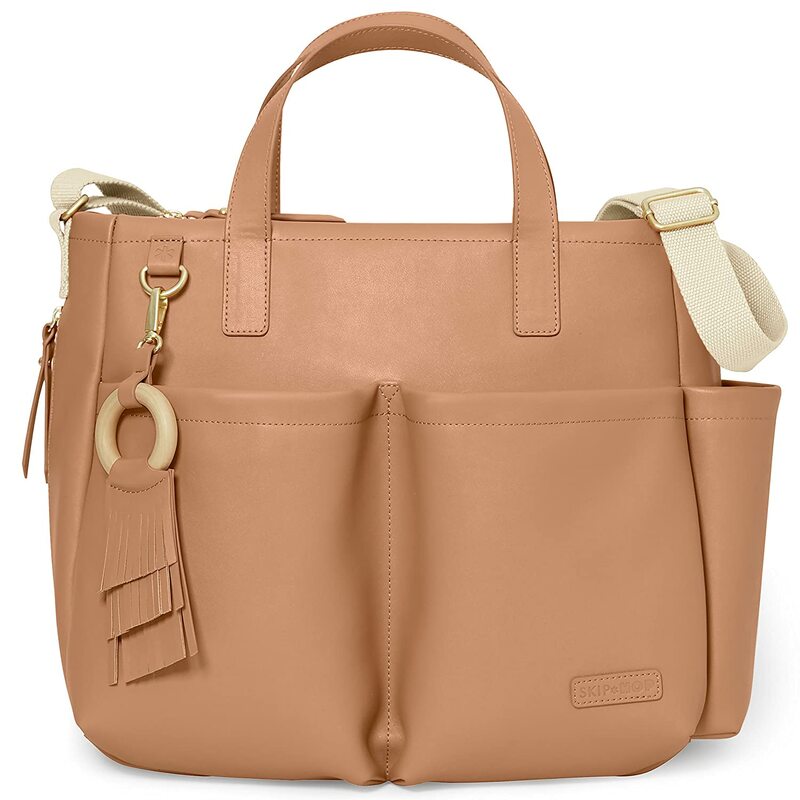 Made from faux leather, Fawn Diaper Bags are among my favorite diaper bags. Their original design has a beautiful finishing and can be the perfect bag to take along for any occasion! It doesn’t even necessarily look like a diaper bag. This is a basic diaper bag that has been designed really well. It’s durable enough to stand up on its own but at the same time lightweight. The bag has plenty of space and easily accessible pockets, but it is a little on the smaller side. I wouldn’t use this with more than one child still in diapers. But otherwise, it’s a perfect choice for someone looking for a stylish and compact diaper bag that looks more like a tote bag and less like a purse. 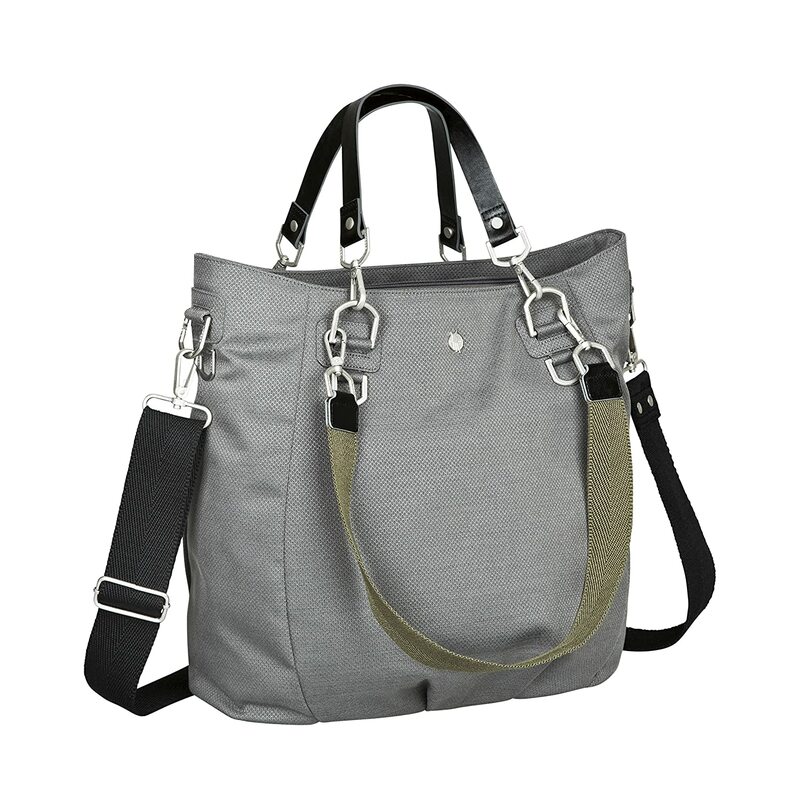 This is one of those stylish diaper bags that perfectly combine elegance with functionality. It’s the size of a regular bag but still roomy enough to fit all your baby’s essentials. The non-slip stroller strap helps to easily convert from a shoulder bag to a stroller bag. Backpacks are the ultimate hands-free diaper bags. The Skip Hop Forma’s lightweight material (and cute quilted design) make it a great choice for multitasking, busy parents. The bag is relatively spacious and has multipurpose compartments to hold snacks and baby clothes. I have one of these and use it on day trips to Disney, the zoo, or anywhere that I’ll be wrangling two kids for an extended period of time. Using a backpack makes it a lot easier, and this is a high-quality bag. It’s also really cute! Definitely recommend. 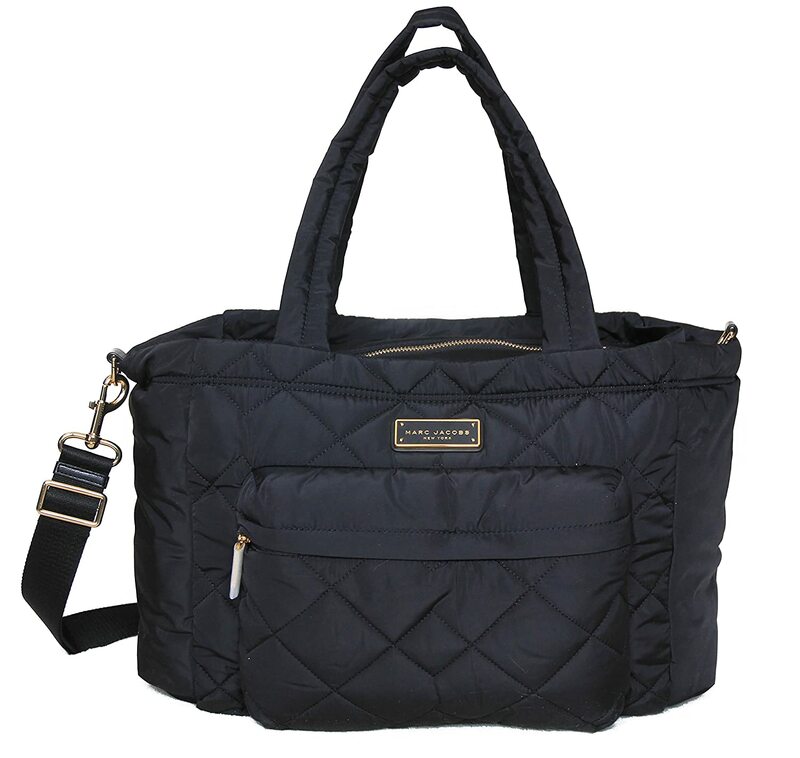 This is a super comfy diaper bag to carry around especially on days when you are out and about. It is water-resistant and the polyester fabric is easy to clean. There’s enough room to store all the baby’s things along with exterior pockets for your personal items. This is a beautiful bag and if you’re looking for something that doesn’t scream “diaper bag” this would be it! Made from vegan leather that is durable and easy to clean, this bag is made for the effortlessly chic moms looking for stylish diaper bags. It can be worn as a crossbody bag or worn as a purse or over the shoulder. 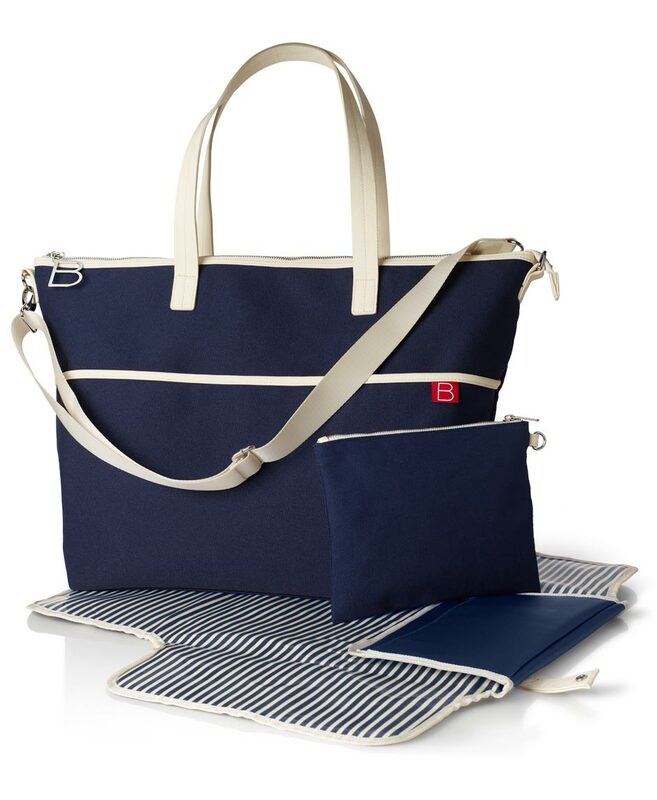 Beautycounter’s super stylish canvas diaper bag has a sleek navy exterior and striped interior. It has a real classic look to it, hence the name. The 7 side pockets are designed to help you always stay organized on the go with your baby. And it is a very sturdy bag that also doesn’t feel too bulky. The diaper bag has an easy-to-clean non-PVC plastic coating. Overall, great pick! 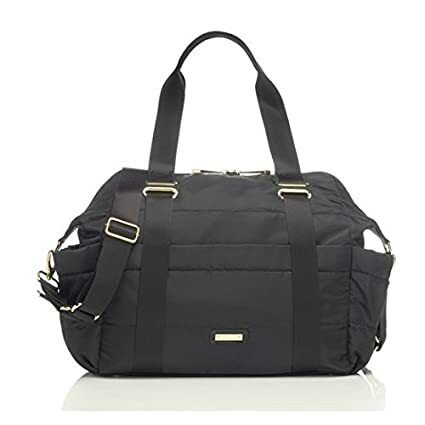 You can also purchase this diaper bag bundled at a discount with Beautycounter’s best-selling baby products here. Boasting a modern design, with all the features of the classic Duo, perhaps the best thing about this bag is its quality. Stroller straps and a changing pad are included. 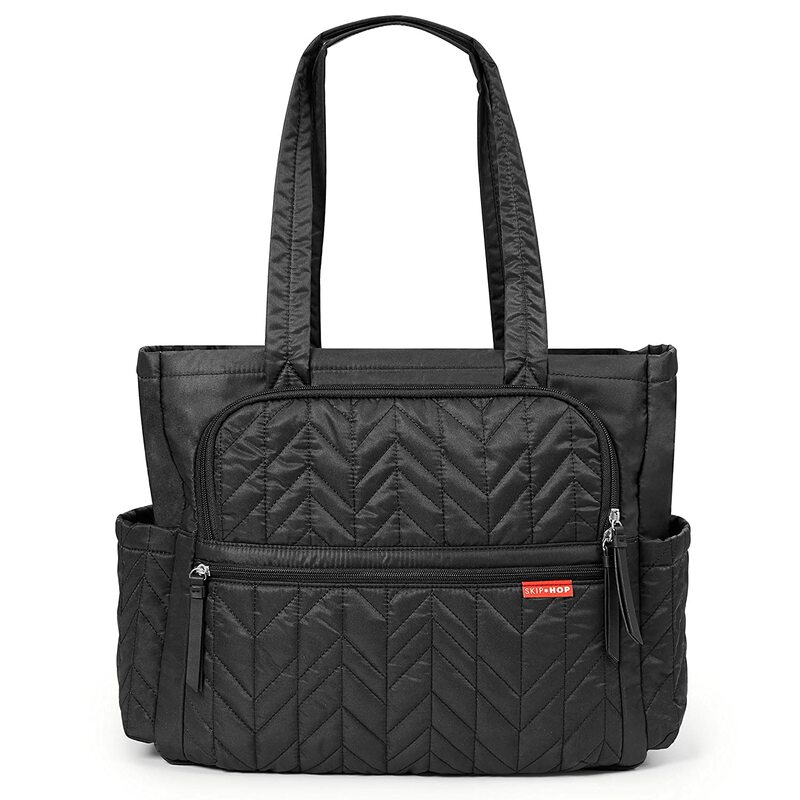 A definite tried and true favorite among diaper bags with a special design and rolled handles. Made from a durable material that is easy to clean, this bag definitely makes it on the list of best diaper bags to buy for your baby! It’s on the pricier side but I really love Marc Jacobs. I’m not a huge fan of designer diaper bags but every time I’ve seen someone with one of his diaper bags, I have definitely gotten diaper bag envy. They’re cute, chic, and functional. This chic bag perfectly combines style and elegance with functionality. I have this bag and have used it for over 4 years now. I originally bought it after a friend of mine showed me hers; I thought it was so elegant and pretty I just had to have one. I don’t think the pictures do it justice. It’s much larger than most Skip Hop diaper bags. It has a lot of space and several compartments for wipes, bottles, and more. I think it’s a really well-designed bag that makes it easy to go out with your baby. Recommend! 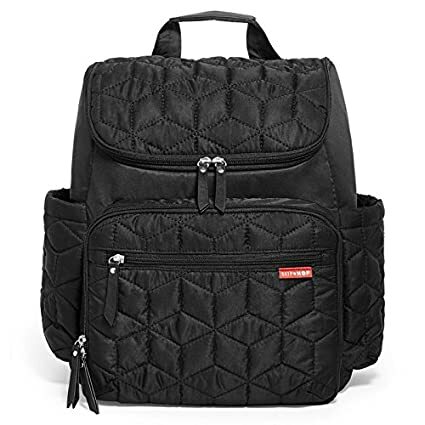 Available in a variety of colors, fabrics and designs, this stylish diaper bag is made from lightweight material and caters to all the features you are looking for in a diaper bag. It is so well made and the design is super cute. I’ve always wanted a Petunia Pickle Bottom diaper bag (but I had to draw the line somewhere…). 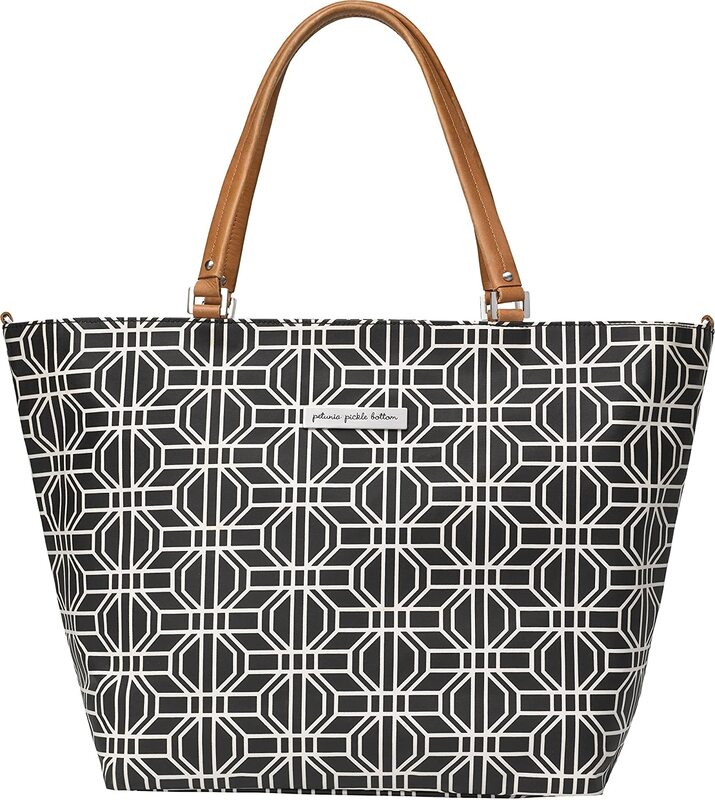 I have always loved Kate Spade designs and had my eye on her adorable diaper bags. 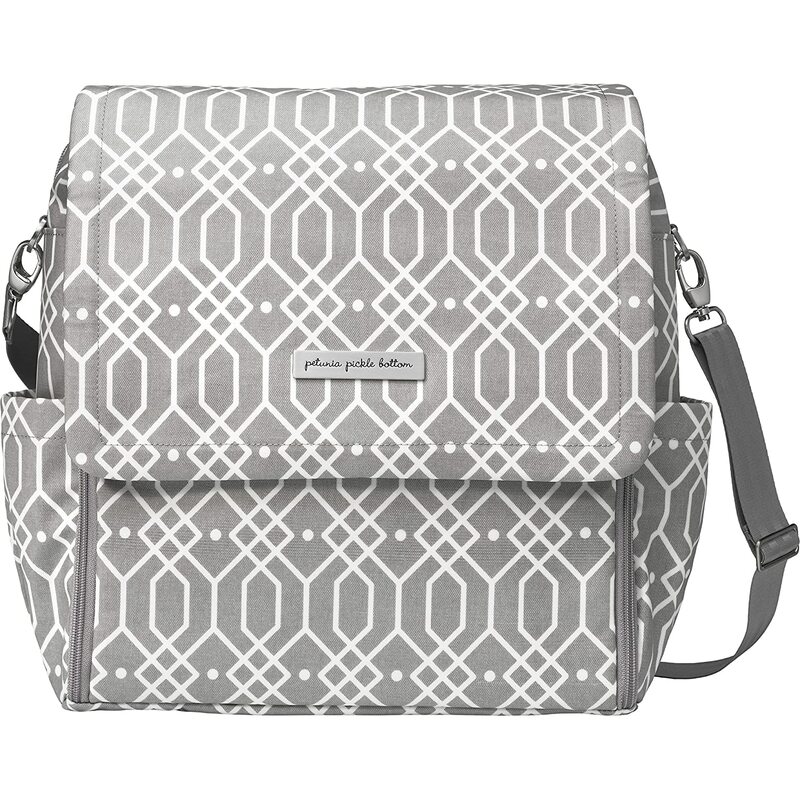 Again, I’m not a huge fan of designer diaper bags (I’d rather put the extra money toward a non-toxic crib mattress or another high-priority baby item) but there are a couple that have made my list because they’re so cute, including this one. 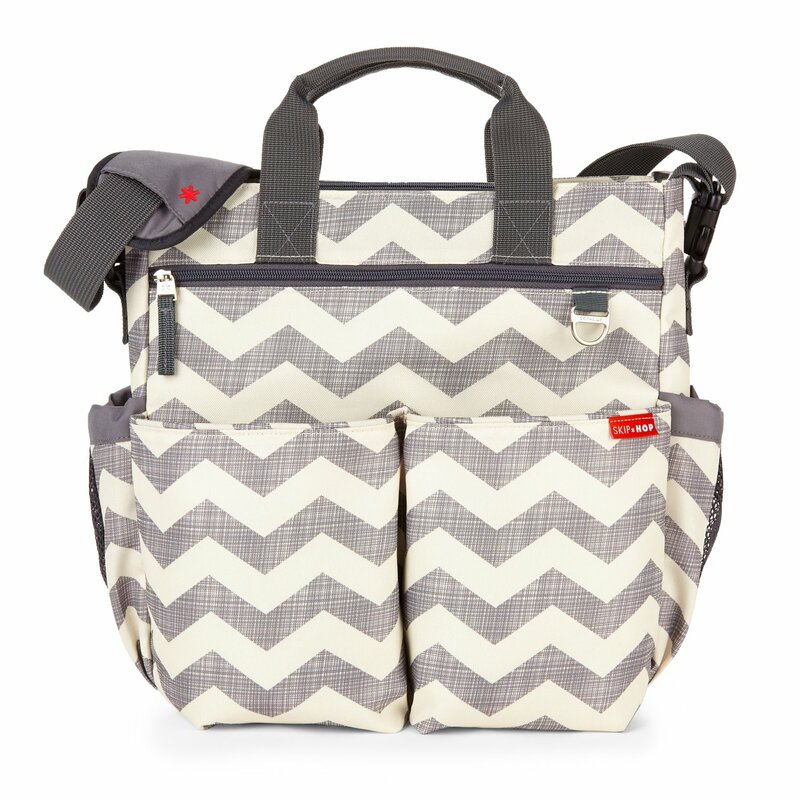 Though it’s hard to tell from the photo, this is a gorgeous and practical diaper bag. It is also quite spacious and it made from black nylon with light gold-plated hardware. Made from faux leather with an eye-catching front panel, this beautifully designed diaper bag is just the right combination of class, style, and functionality. I am swooning over the dusty pink color! It also looks like a regular tote bag, so it’s definitely something you could continue using long after your baby is in diapers (as long as you don’t mind the “Baby” in “Babymel of London” on their logo). 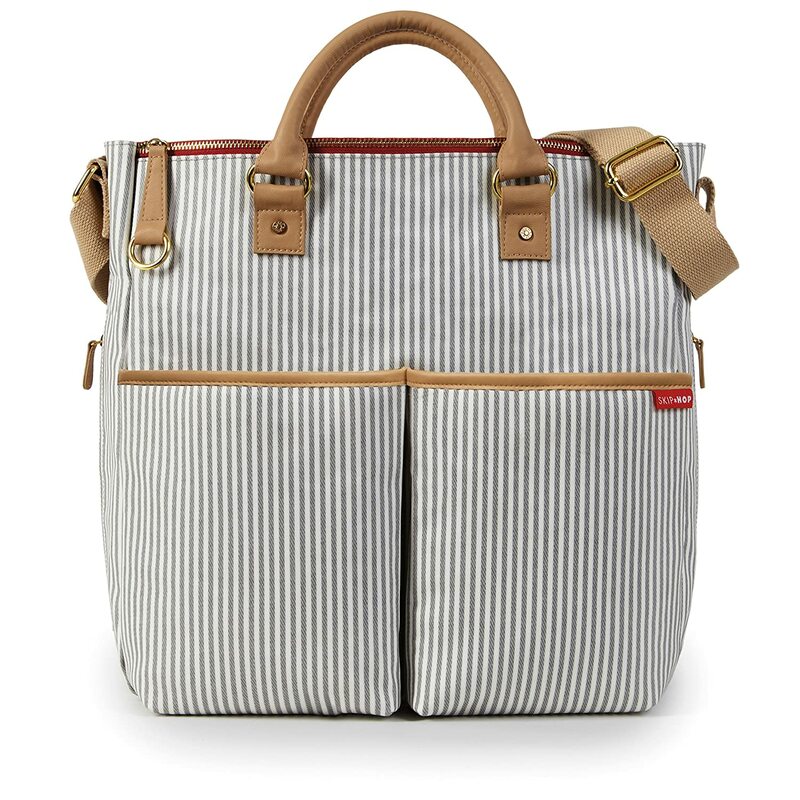 Pottery Barn Kids has some adorable diaper bags, including their classic diaper bag. If you’re a fan of preppy style or just want a sturdy and spacious bag, this is a great way to go. This stylish diaper bag will not leave you disappointed; with an exterior made from polyester and an interior lined with nylon, this sturdy bag is not only durable but also chic enough to use for when your kids are out of diapers! 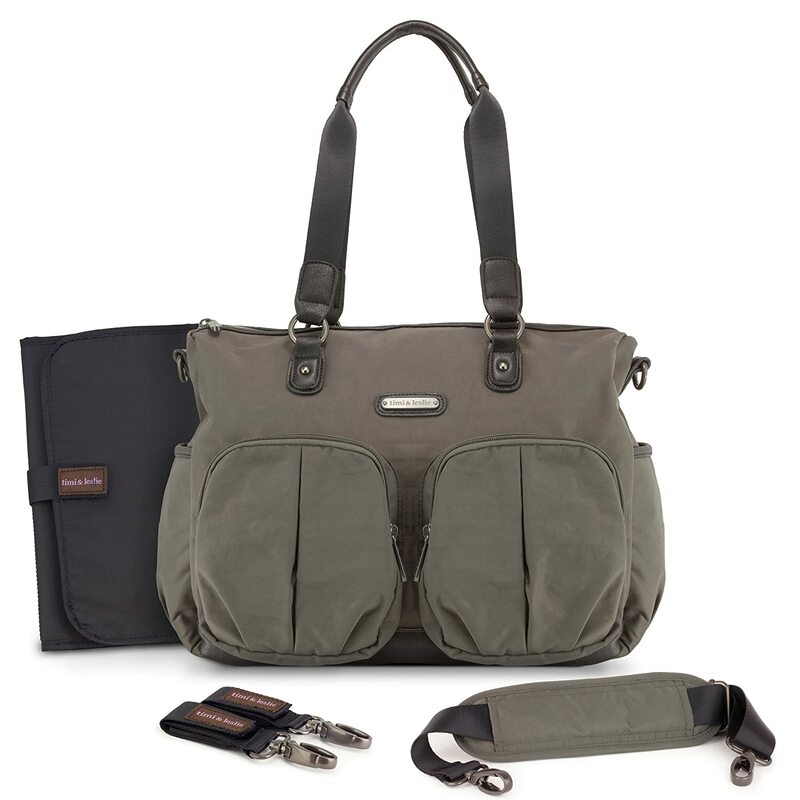 If you’re looking for a sporty, lightweight, comfy diaper bag that looks stylish at the same time, this might be the one for you! It is SO chic. I have a few friends who have this bag and it is gorgeous. It’s also spacious and includes a super handy insulated food and bottle bag. Made from a premium canvas fabric that can easily be cleaned, this bag combines style with practicality. Storksak is on the pricey side, but their bags are so well-designed they can be used long after your baby is in diapers. 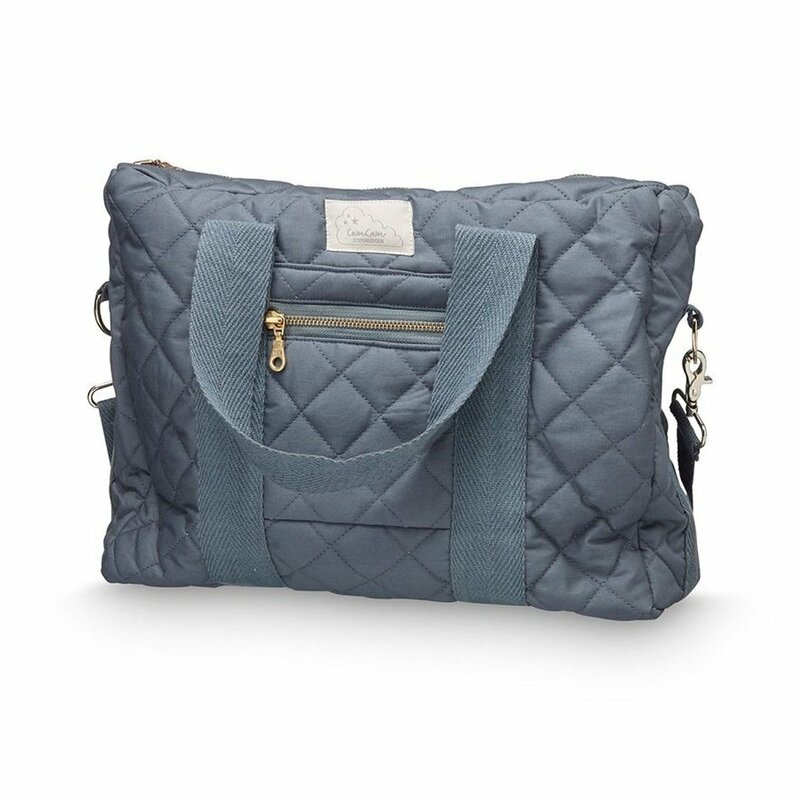 Made from 100% organic cotton with an Oeko-Tex polyester filling, this stylish diaper bag is a great choice for someone looking for a non-toxic diaper bag that is easy to carry and looks chic! Availability is limited, so you may not find them on Amazon; you can shop on their website here. I hope you’re all set with your diaper bag! Which one did you choose?